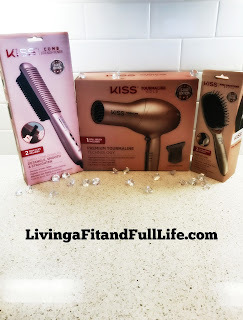 Living a Fit and Full Life: KISS Products, Inc. Debuts The Kiss Gold Series, A Collection Of Luxurious Hair Tools! KISS Products, Inc. Debuts The Kiss Gold Series, A Collection Of Luxurious Hair Tools! Inspired by the fashion trend in electronic appliances, Premium Tourmaline Gold drives consumers’ enthusiasm to add a touch of whimsy to their home appliances. On top of its beautiful look, Tourmaline Gold generates heat and negative ions making hair lustrous and free of frizz, faster in drying, which leads to less risk of hair cuticle damage. Luxurious Premium Finish Coated with Matte Gold. This unique, slim styling brush detangles and straightens hair simultaneously with no skills. This sleek design makes every women’s busy mornings less stressful with two times faster styling for any occasions. The distinctive triangular comb design lets users style their hair from short to long, from straightening to volumizing, and from creating bangs to flipping. 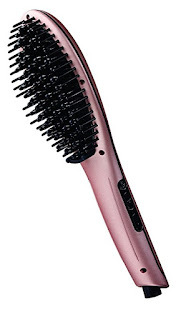 The heated comb produces salon-quality results while protecting the hair and scalp. 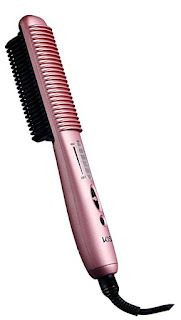 KISS Bristle Straightener is for easy and fast styling tool to get silky straight hair results. The brush design keeps the scalp safe from the heat as well as reducing fizziness, splitting ends, knotting and increasing hair manageability, leaving hair silky and lustrous. Great for all hair types! Simply Brush to Smooth and Straighten. KISS Products, Inc. debuts The Kiss Gold Series, a collection of luxurious hair tools! In this amazing collection you have the Tourmaline Hairdryer Gold Edition, Comb Straightener Gold Edition and the Gold Edition Bristle Straightener. Each product is absolutely beautiful and provides amazingly terrific results! Kiss Products Tourmaline Hairdryer Gold Edition has to be one of my all time favorite hair dryers! The Tourmaline Gold Hairdryer generates heat and negative ions which helps to dry hair much faster as well as prevent frizz and flyaways. I've only been using this hair dryer for about a week and I love how shiny it makes my hair. I also love that my fine hair isn't frizzy anymore and that my flyaways are finally tamed. Kiss Products Tourmaline Hairdryer Gold Edition has 3 heat settings and 2 speed settings so you can control both the heat and the speed. I also really like that the Tourmaline Hairdryer Gold Edition has a cool shot button because that also seems to help prevent frizz as well as set my hair style in place for the day. 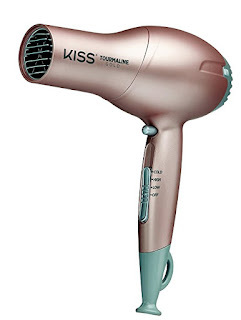 Kiss Products Tourmaline Hairdryer Gold Edition is an amazing hair dryer with all the bells and whistles and then some and I highly recommend it! Kiss Products Comb Straightener Gold Edition both detangles and straightens hair with amazing results. I love that I can also use the Comb Straightener Gold Edition to add volume to my very fine limp hair quicker than any other method I've tried in the past. It's root lifting capabilities are phenomenal and I absolutely love the results! I also love how quickly it heats up and that it too has Anti-Frizz Ionic technology so my hair is smoother, less frizzy and much shinier. Kiss Products Comb Straightener Gold Edition is a phenomenal product that all my fine haired friends need in their hair styling routine! Kiss Products Gold Edition Bristle Straightener is the quickest and easiest way to style my hair in the mornings. It heats up quickly and straightens hair while detangling it. I have 3 daughters and I made the mistake of straightening my 9 year old's hair one time and now they all come in the bathroom while I'm doing my hair and ask me to straighten their hair. Of course, I cannot tell their sweet little faces no so I end up making us all late for whatever we're getting ready for. My husband hates it, but at least we all look good. I used the Kiss Products Gold Edition Bristle Straightener on my hair and all 3 of my girls and when we came out of the bathroom my husband was blown away that we were actually going to be somewhere on time. The Kiss Products Gold Edition Bristle Straightener not only straightens and detangles my hair but all 3 of my girl's hair and in record time I might add. Kiss Products Gold Edition Bristle Straightener gives both me and my daughters perfectly straight, frizz free, shiny hair in record time and I highly recommend it! Click HERE to learn more about KISS Products! Follow KISS Products on social media!